The garden is taking up most of my non-work time lately, so there hasn't been much sewing going on. Not to mention the fact that our ancient thrift-store iron finally gave up the ghost. But! The good news is that I bought a new iron -- a Silver Star gravity feed iron. Can I just say? Amazing. It stays hot and creates steam like nobody's business. I made my own bias tape for the first time a couple days ago and it came out perfectly. Heaven. And it was only $90, which is about the same price as a nice Rowenta. I'm so in love. To test it out, I made a Colette Sorbetto blouse (pictures to come.) That's what the bias tape was for. Since I'd never made bias tape before, I used a white sheet from the thrift shop and had a couple of false starts, but in the end, it came out just as I wanted. And so much softer than the store-bought stuff! While the new iron has been amazing, the garden is what's taking up most of my time. ... and not-so-baby cucumbers. Those things get huge in a hurry! And then they become pickles! I've made four pints of pickle slices so far and I envision more in my future. We've been eating lots of salad and I just took four cucumbers out to my parents and we still have two and a half in the refrigerator. The basil is also growing gangbusters. I've also made pesto twice; we've got three cups of it in the freezer already. Summer's the best, isn't it? And it's only July! I cannot say enough good things about the Bombshell Swimsuit pattern. The pattern is well drafted and easy to put together and the cut of the swimsuit is super flattering. I never thought I'd post pictures of myself in a swimsuit on the Internet, but this is one swimsuit I'm not ashamed of wearing. It covers everything I want covered, it camouflages everything that needs camouflage and it's not in the least bit skimpy. I feel good about it and I feel good about wearing it in public. The pattern was a PDF and it was really simple to put together. All the sheets are numbered and they print in the order you put them together, so I got it all taped together on a board in the middle of our basement one night during TV time. Last time I used a PDF pattern, assembling the sheets confused me so much because the sheets weren't numbered, but this one was really simple. You definitely need to print the instructions in color, though. I didn't and just ended up using the sew-along as directions, which was WONDERFUL. The step-by-step online instructions are amazing. I've never done a sew-along before, but now I see why they're so popular! I messed up a few things and I kind of want to make another just so I can do it correctly. I thought the fabric was four-way stretch. And while it's stretchy all four ways, it's MUCH stretchier in one direction. And I cut it exactly the wrong way. Basically I'm a dunce. I can wiggle my way into the suit, and it fits perfectly once it's on, but it's TOUGH to get on and off and consequently I'm not sure how long the seams will hold up. You can see how they're stretching in the side and back view pictures. It's because I have to roll and pull and work my way in. I also cut the darts into the lining because the line on the pattern is a solid line and I wasn't thinking. But guess what? Making a swimsuit is CHEAP compared to buying one. I bought a Victoria's Secret bikini last summer and it was $70. Fabric, notions, everything for this came to $20, despite the fact that I had to buy 2 yards of fabric when I only needed 1.5 yards. So I don't really feel bad about making a second one. Plus, it was a really fun make! In terms of sizing, I cut an 8 at the top, a 10 in the middle and a 12 at the bottom (I'm a total pear). Since it's stretchy, I just eyeballed the grading. I also read that Heather Lou added three inches to the suit for her 5'10" friend. Since I'm 5'9", I added 2 inches to my suit. Ruching, by the way, is really easy with swim fabric! It's so slidey that it just ruches on up easily. I sewed all the seams with my serger -- I loved how the pattern included serger instructions. Most knit patterns I've worked with don't. I guess they assume that if you have a serger, you know when to use it, but it's so nice when instructions are included for them. So what do you think? What color should I make the next one in? I saw a really pretty white one somewhere... or maybe another print? What kind of fabric did you make yours out of? June was a whirlwind! Greg and I both have our birthdays in June, so we had a big party one weekend. And then we went to Colorado to see one of his college friends get married. It was quite the month! We started with Greg's birthday, for which we went camping at Shenandoah National Park. Shenandoah is one of the few national parks that allows dogs, so Lyra got to go, too. She went in the water for the first time since we got her (we hiked down to a river) and we discovered that she must have an ancestor that's a river otter. 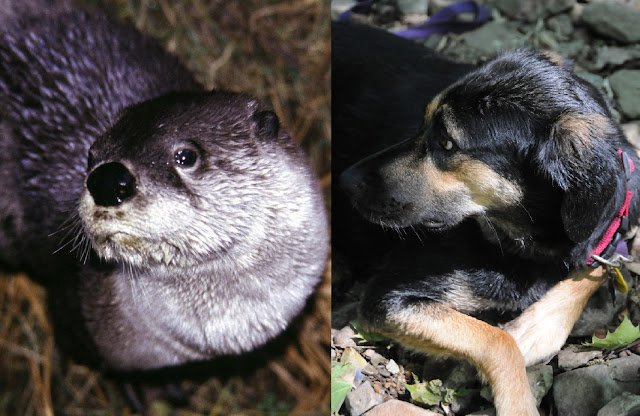 Which one is my dog and which is an otter? We also had a nice party for our friends and families. I couldn't resist making one of these signs out of a shoebox lid. 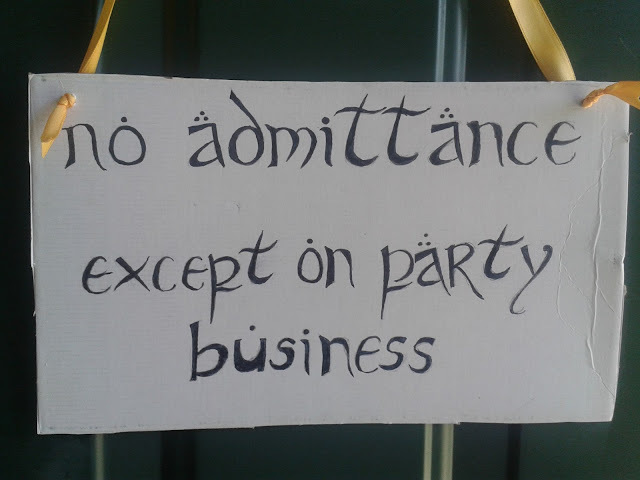 Greg and I are big Lord of the Rings fans. I outlined the letters in pencil and then filled them in with my fountain pen. Not as awesome as some of these signs I've seen, but people seemed to like it. For my actual birthday, we were in Boulder, Colo., attending the wedding of one of Greg's college friends. It is so beautiful there! 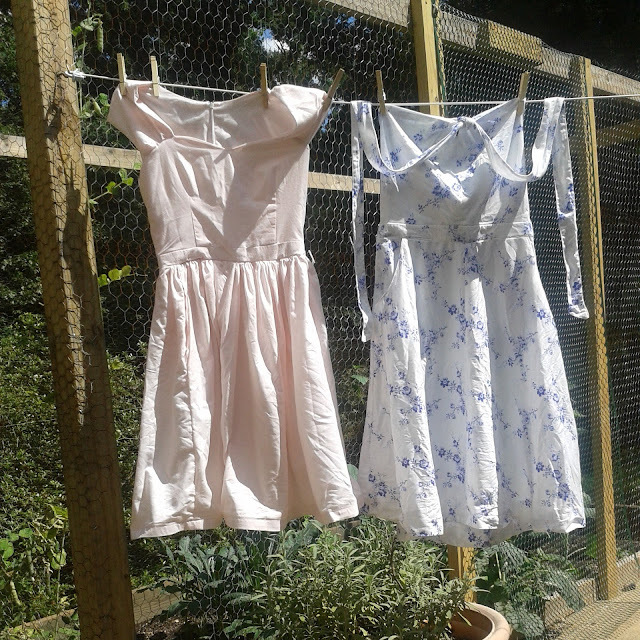 I wore both my Lonsdale and my Cambie wearable muslin and they were much admired by all. But speaking of Greg's friend's mom, (that's a mouthful, isn't it?) she directed me to the CUTEST little fabric store right by our hotel. I stopped by the day we left and fell in love. The ladies in Elfriede's were amazing! When I walked in, they asked if they could help, and I told them I was just visiting from out of town, so they gave me a tour of the store, asked about the clothes I was wearing, invited me to "play" with whatever I wanted and generally were the sweetest and most hospitable people. The heart print is a knit that I thought would be a cute t-shirt. The hearts are very slightly raised and kind of velvety. I couldn't remember the yardage for the pattern I wanted, and was about to guess, when the lady (owner maybe?) whipped out a measuring tape, measured the t-shirt I had on and proclaimed that a yard would do. The pink is a sweet printed cotton -- sundress maybe? I also got some white cotton summer lining, some fold-over elastic to try out those hair ties everyone is loving (how do they sell them in the drug store for so much money when the elastic is so cheap?) and some silk threads. I was really jealous recently of Ami's hand-done buttonholes and they had the Gutterman twist silk thread she recommended, which I've never seen before, so I bought a roll to try. They also sold Liberty prints, but I didn't buy any. They really are gorgeous though -- I'd never seen any in person. Seriously, if you're ever in Boulder, you must stop by Elfriede's. I finished my Bombshell swimsuit last night, so expect a post soon -- I'm hoping it's sunny tomorrow so I can get some pictures accomplished. I absolutely love the way the swimsuit came out and I'm just itching to make a second one (I made a couple mistakes on the first), but, as Greg says, how many swimsuits do I need in one summer?